Oh you wanted to know the sinfully delicious secret? Ah, well ok. I guess I can share it with you. You can eat healthy while on the run. And you can do it without breaking your wallet. 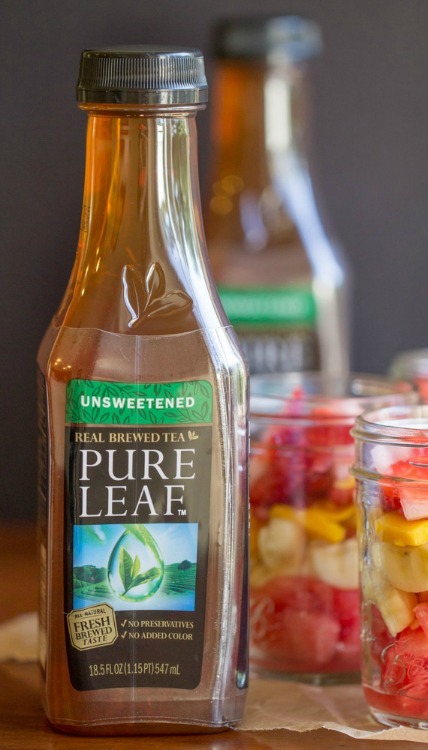 Keeping your fridge stocked with Lipton Pure Leaf Unsweetened Tea and pre-made fruit salads make for one darn easy grab and go snacking adventure. Just make your fruit salads, put them into cute little mason jars, cover with the cute little mason jar lids and put them in your fridge. And to make it even easier on you, just plop ’em on the shelf next to your Pure Leaf Tea. Then you don’t have to dig past mystery refrigerator items to find the goods. I ain’t gonna lie. When I’m at work, I like to snack. I think it’s what you’d call snacking out of boredom. I get bored. I snack. If I don’t bring a snack to work with me, I end up in the snack box. You know what I’m talking about, the old school vending machine. The cardboard box that’s filled with tempting snacks like cookies and potato chips and candy bars. The stuff that makes snacking out of boredom turn into snacking on the pounds. Now my philosophy is all about moderation but if you suffer from snacking from boredom like I do, then moderation ain’t gonna happen if you hit that snack box everyday. So make fruit salads and buy some Lipton Pure Leaf tea. Take them to work with you. End your relationship with the evil snack box. Turn snacking on the pounds into snacking on the healthy. You’re probably thinking to yourself, ok, ok, I get this eat healthy on the run thing but how does the eat healthy on a budget thing work? Simple. Buy fruits and veggies when they’re on sale. Or fruits and veggies that are always cheap. Bananas run about .69 per pound at my grocery store. That’s pretty darn cheap, if you ask me. And a banana is probably the easiest darn fruit you can eat. Just grab, peel and eat. Since strawberries are in season, they are on sale 2 big packages for $5.00. You can always buy in bulk and freeze for later. Or you can buy frozen fruits and use those to. I prefer fresh but I will use frozen in baked goods and smoothies. OH, and quit buying that soda. Soda is bad for you. Even diet soda. It has tons of nasty stuff in it. But ok, I ain’t gonna lie – I enjoy a diet rootbeer or a diet cola on occasion but on a daily basis, it’s water, coffee or unsweet tea. Lipton Pure Leaf makes it easy for me to take an unsweet tea to work. I just grab a bottle from my fridge and put it in my lunch box. Going shopping but need caffeine? I just grab a Lipton Pure Leaf from my fridge and take it along for the ride. 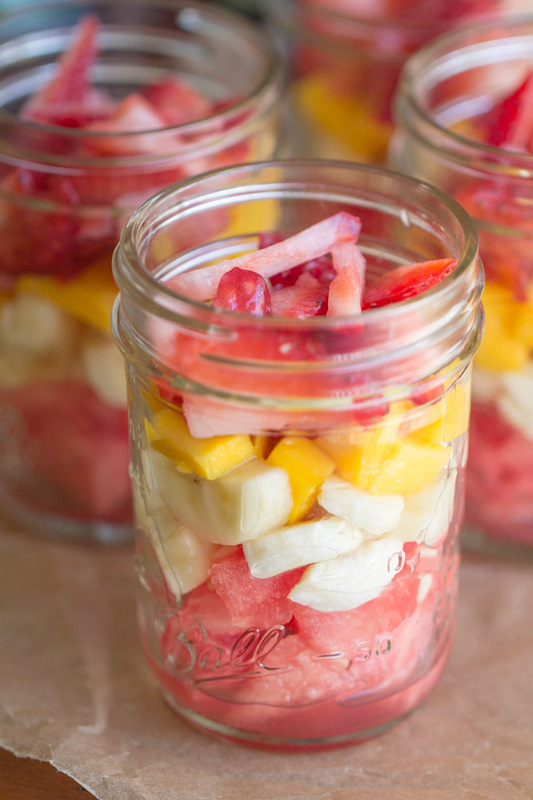 Layer the fruits in 6-8oz mason jars. The tea sounds delicious and love your fruit salad. I’ll have to try it! Thank you, Paula! Yes, the tea is great! They also have flavored options but I always go for the unsweet. :) I love it when I get the sponsored posts for products that I’ve actually tried and love. I don’t put things in mason jars nearly enough… unless it is a mixed drink. 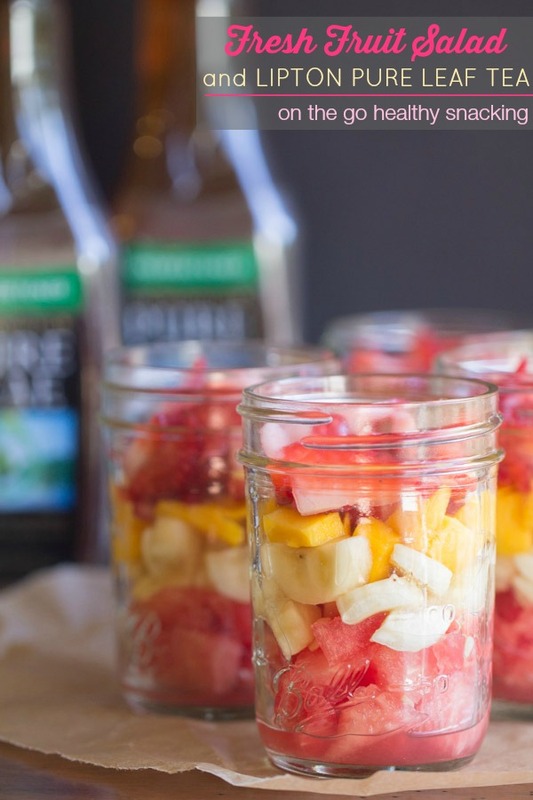 ;) I love this idea to toss cut fruit in mason jars for an on-the-go healthy treat! I need to start doing this when baby girl & I head to park… you know, when the weather gets consistently warmer here, lol. Oh mixed drinks in mason jars, you say? Why the heck haven’t I done that?! I almost always make a vodka/cranberry/club soda on the weekend. I need to put it in the mason jar this weekend. 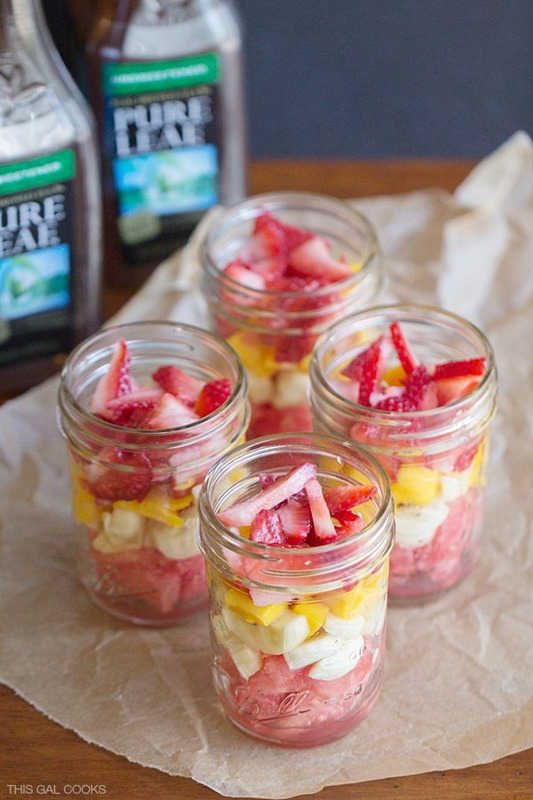 I love layered fruit salads and I love those little mason jars they are the perfect snack size, so fun! The fruit salad looks DELISH and I love that Lipton pure leaf tea. It’s the only bottled tea I like. Pinning! I’m kinda on a tea kick right now. I just drank a bottle of the unsweet tea…probably not a good thing since it has caffeine in it and I have to go to bed soon! But it’s what I was craving and it hit the spot. Thanks so much for stopping by, Ashley! I love to snack at work and these are way healthier than some of things I’m eating :-) Thanks for sharing this recipe Julie – pinning!